Way back in November I read these posts by Poppy Dinsey about her morning and evening skincare routine. At the time I had two thoughts: how ridiculous! Why on earth would one have a different routine for morning and night? And also: Caroline Hirons, eh? She gave this advice? Let me look her up and see if I can get a consultation… I want better skin. And so, after six months of waiting I paid £65 for the one hour appointment and met with the Hirons herself. She said that while I’ve got a decent diet and lifestyle (and by that I mean I get my 5-a-day nearly every day, exercise, wash my makeup off every night, don’t smoke, get enough sleep every night, drink loads of water and don’t drink loads of alcohol) my skin just wasn’t reflecting any of this. Thus, with a good skincare routine and the right products I should be able to get my skin up to snuff. A quick look at my skin and she could tell it was oily yet dehydrated; a quick ask about my beauty routine (the same cleanser morning and night, followed by a day/night moisturiser) and she said it was lacking. Then she was off with her recommendations! I walked out of her office with a paper full of product recommendations and a bag full of samples, but I won’t talk about those in this post. Instead, I’ll talk about the products I’ve purchased off the back of her advice to incorporate into my routine. Cleanser: I talked about this one in Round 1, but the Aurelia Miracle Cleanser* (£34 for 120ml from the Aurelia website) that I received as a gift at a beauty event has earned it’s place in my cupboard. I love the fresh scent in the morning, and I’m convinced the probiotics in it are doing something to help minimise breakouts. Toner: Caroline recommended both the REN Clarimatte toner (£12 for 150ml from REN) and the Ole Henriksen Grease Relief Face Tonic (£21 for 207ml from BeautyBay.com). So far I’ve not decided which one I prefer, but my skin is looking/feeling better so I’ll carry on alternating between the two until I figure it out. Hydrate: For this stage she suggested that I use a floral water such as Melvita’s Damask Rose Floral Water. (£16 for 200ml from Melvita) To be honest, I’m not sure what this adds to my routine, but it feels incredibly refreshing (especially after a hot yoga session!) and I love the smell, so I’ll happily carry on. Eyes: She said this part of the routine was optional at my age, but the REN Active 7 Radiant Eye Gel (£20 for 15ml from the REN site) was on offer at a shop local to me so I decided to give it a go. I haven’t seen a difference with my under eye area since I started using it, but I do feel a difference on the days when I haven’t had the best sleep; when I use it then, my eyes feel more open and alert. 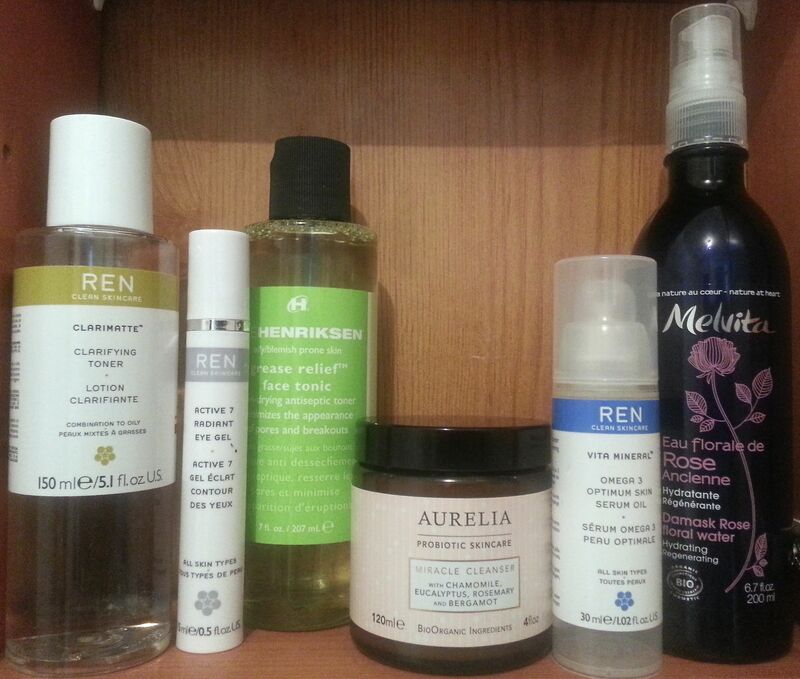 Treatment: Another REN product, and this time the Omega 3 Optimum Skin Serum Oil (£23 for 30ml from the REN site). This one smells delicious and leaves my skin looking dewy and fresh. It was love at first try, and since I’ve incorporated this product into my routine I’ve seen a notable improvement to how hydrated my skin is. Result! Toner: I only recently purchased Caroline’s recommendation of Peter Thomas Roth’s Gentle Complexion Correction Pads (£23.95 for 60 pads from BeautyBay.com), but after only a handful of uses I can really see the benefits of these bad boys. They’re designed for acne prone skin, and they’ve done wonders with shrinking my blemishes. While they are gentle enough for daily use, the formula is strong and I personally wouldn’t use it more than once a day. Hydrate: Melvita’s Damask Rose Floral Water, same as above. Eyes: Nada – I’m a rebel and I skip this step! 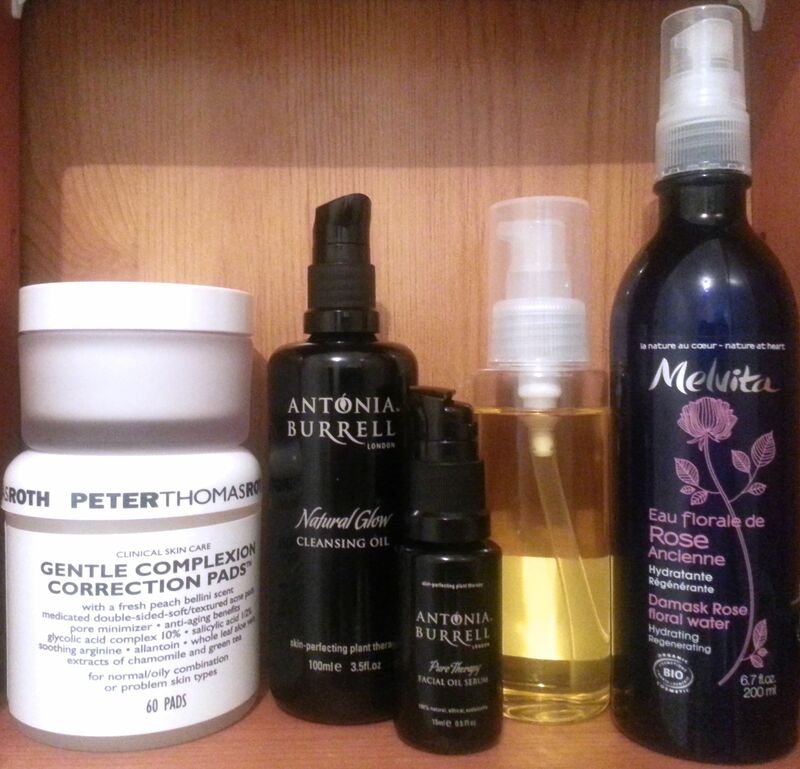 Treatment: Neither of these are products that Caroline specifically mentioned, but nightly I’ve been alternating between Antonia Burrell’s Pure Therapy Facial Oil Serum* (£58.80 for 15ml from her site) and cosmetic argan oil (the unbranded bottle in the above picture). I received this Facial Oil Serum as a gift from Antonia herself, and I love the scent and my skin feels much more balanced since using it. This particular argan oil I purchased in Morocco on the cheap, though there are many brands of argan oil with various price points available in the UK. I’ll be honest, my dear readers, I feel much more empowered with my skincare journey since meeting Caroline. If you’re interested in booking an appointment with her, please see this section of her blog. Please note: I paid full price for the consultation with Caroline Hirons, and it was damned well worth it! *However, products marked with asterisks are gifts that I did not pay for, and all views expressed are my own. Tags: Antonia Burrell Natural Glow Cleansing Oil, Antonia Burrell Pure Therapy Facial Oil Serum, Argan Oil, Aurelia Miracle Cleanser, Caroline Hirons, Eye Cream, Facial Cleanser, Facial Serum, Facial Spray, Facial Treatment, Melvita Damask Rose Floral Water, Ole Henriksen Grease Relief Face Tonic, Peter Thomas Roth Gentle Complexion Correction Pads, Ren, REN Active 7 Radiant Eye Gel, REN Clarimatte toner, REN Omega 3 Optimum Skin Serum Oil, RMS Beauty Raw Coconut Cream, Skin Care, Toner. Bookmark the permalink. Hello, Just wondering if you are still using this routine and if your skin improved?